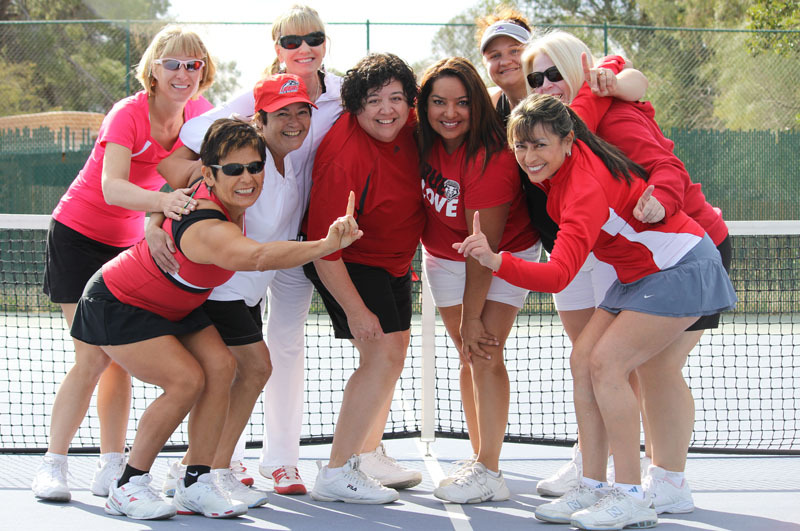 USTA League is changing its structure and format for the 2013 National Championship Year, and those changes will affect many of our Local League seasons as early as fall 2012, since many of our districts hold Early Start 2013 Leagues. Gone will be the monikers "Senior" (50 & over) and "Super Senior" (60 & over) to describe classifications of play, replaced instead by a more representative grouping based on age. Levels will now be called 'Adult' with the age grouping behind it. USTA League research and focus group results predict a significant increase in the coming years in league participation. These changes are designed to better align age groups with current and future league populations. 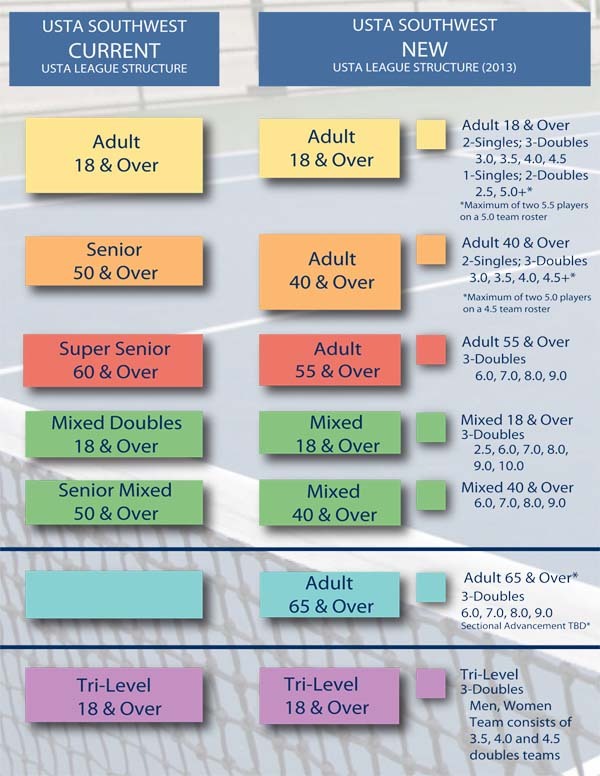 Under the new structure, the USTA League National Championships will fall under just two divisions—Adult and Mixed. The Adult Division will be broken down into 18 & over, 40 & over, and 55 & over. The Mixed Division will be 18 & over (which is the same as the previous format) and the 40 & Over Mixed Type which advances to a National Invitational. As they had previously, players will continue to compete by NTRP rating within each division. 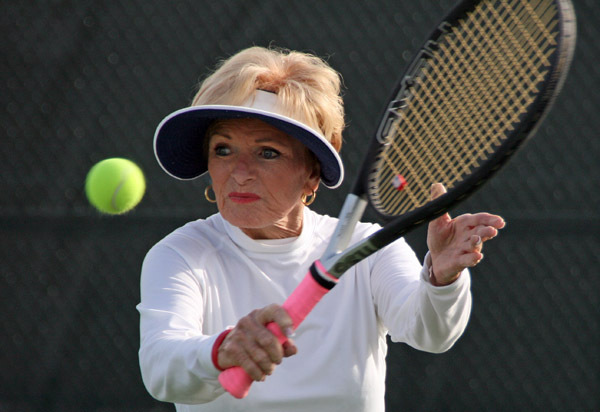 Although not yet offered as an official USTA League Division, we are not ignoring our 65 and Over population. In fact, the USTA is encouraging sections and local leagues to offer Adult 65 and Over leagues, with the intent to launch a National Program in the near future. We here in the Southwest Setion have made the commitment to offer Adult 65 and Over and are encouraging Districts to participate with this as soon as possible. Check with your Local League Coordinator to find out if Adult 65 and Over will be offered in your area. The Adult 65 & Over division will feature three doubles matches offered at the "Combo NTRP" format for local league play (doubles teams of combined NTRP levels of 6.0, 7.0, 8.0 and 9.0 with no more than 1 point spread). 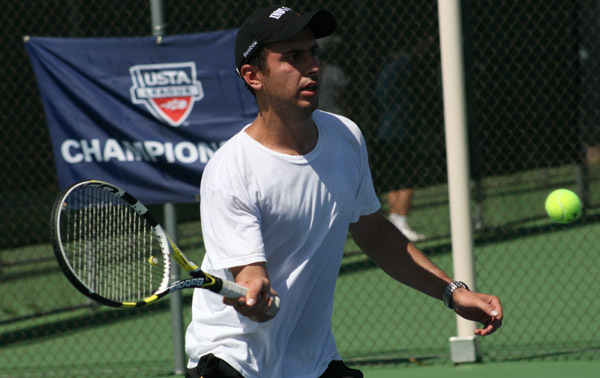 In line with the USTA League restructuring to take place in 2013, the USTA Southwest Section wants to educate players on how this league restructure will affect its players through a series of Town Hall Meetings across our areas. Check with your District to find out if a Town Hall Meeting is scheduled in your area. If not, ask your local league coordinator about helping to drum up interest in these as players need to be educated on the changes. The Mixed Doubles Division Section Championships for both age groups will be offered over the same weekend. The USTA Southwest Section League Committee is currently discussing offering a league section championship for the 65 & Over Division as soon as we see active participation from the majority of districts. Dates for all of these 2013 events will be decided upon soon and released as soon as they are. None of these league restructure changes will affect any of the Section Championships currently schedule in 2012. "USTA Southwest is very excited about the new opportunities that will be available to players with the upcoming age division restructuring. This is going to provide additional play opportunities and provide even more competitive matches for our members which will result in better NTRP ratings," said USTA Southwest Adult/Senior Competitive Manager, Lindsey Keeler. Added Keeler: "The restructuring guarantees more frequency of play opportunities at more appropriate age divisions." The Adult 18 & Over and the Adult 40 & Over divisions will feature both singles and doubles, while the Adult 55 & Over, Adult 65 & Over, Mixed 18 and Over, and Mixed 40 and Over will consist of three doubles positions. Additional league restructuring possibilities include rule changes designed to give 5.0 and 5.5-rated singles players more league play opportunities, and will be officially announced soon. Click on your District Below to find out how this will affect you at the local level. *If your area is not listed, please contact your Local League Coordinator to inquire about how your local leagues will be run for the 2013 League season. Check this chart out below to see a list of differences between previous leagues and leagues beginning for the 2013 league season. Owned and operated by a tennis-playing family, All About Tennis is Arizona's largest tennis retail store. They are longtime sponsors of local programs in Phoenix, including USTA League Tennis programs. Their store is centrally located in Scottsdale, Ariz.
Head/Penn is the national sponsor of the USTA Leagues and has been for a quarter of a century. and are the No. 1 selling tennis ball in America.